In our 450th anniversary year we are celebrating excellent A Level results. 70% of entries at A Level were awarded at grades A*-B of which 41% were A*-A grades or the equivalent. 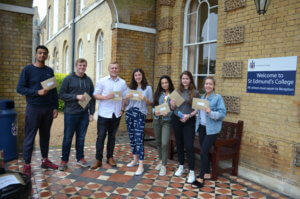 Further Mathematics A Level students achieved 100% A*-B grades and Mathematics students achieved 79.3% A*-B grades. Our English Literature A Level students secured a remarkable clutch of 92% grades at A*-B. We are delighted to announce our best ever GCSE results which partner excellent A Level results making this, our 450th anniversary year even more of a celebration! A Level students collecting results 2018.